Complete backup of your entire email server. Quick and easy recovery of all or any lost/deleted messages. All organizations exchange important information via emails. Emails are an important mode of communication as they serve as a record of tasks and contain confidential company information pertaining to commerce, policy decisions etc. Thus, email outage results in loss of productive time. IDrive ensures business continuity by backing up Exchange servers without interrupting their operation and allowing you to retrieve all or selected email(s) that may have been lost or deleted. Perform easy, secure, fast and reliable backups of your MS Exchange Server databases to your IDrive account. The application can backup/restore the MS Exchange Server databases without interrupting the running MS Exchange Server services. Backup of the MS Exchange Server databases is a method for complete backup (or recovery) of the Exchange Server databases. View the steps to backup the MS Exchange Server to the IDrive account. The 'Exchange Brick-Level Mailbox Backup' method allows you to backup individual mailboxes on the MS Exchange Store to your IDrive account. The application backs up the contents of the selected mailboxes to a Personal Folder (.PST) file. It is designed to backup/restore individual mailboxes for selected mailbox stores. It is not a method for complete backup or recovery of Exchange database. 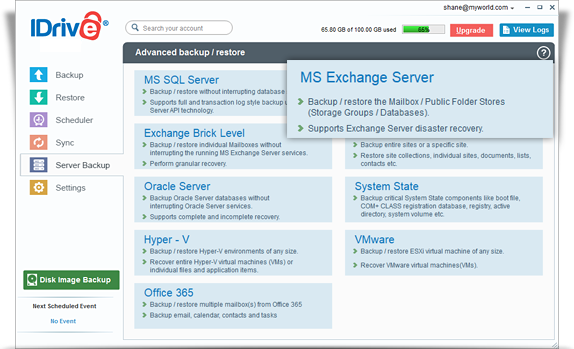 View the steps to backup the MS Exchange Brick-Level Mailbox to the IDrive account.